Temperature chart of the earth, from Precambrian time to current. Current is on the right. In my years I have gone from rotary phones to the iPhone. From smoking is good for you to smoking is bad. That eggs are full of cholesterol and will kill you to eggs are healthy. All I know at this point in my life is that the more sure the general consensus is of something, the more sure I am it is going to be changed in the future. I don’t weigh in on global warming. I just have a healthy skepticism. 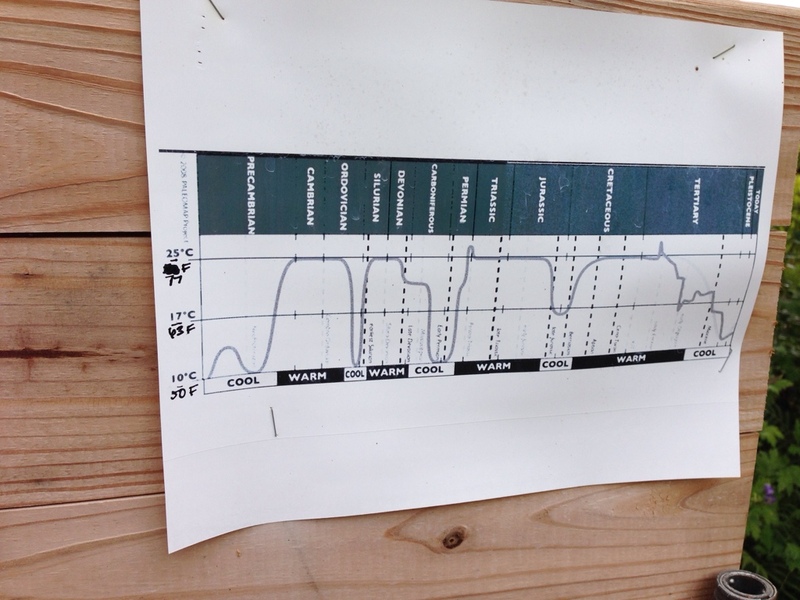 While on the plant delights nursery tour yesterday, Tony showed us the above chart that’s shows the average worldwide temperature back to the time of the dinosaurs. Current averages are the far right data point. I haven’t independently verified the chart, but it makes for interesting conversation. If we are getting warmer, based on this chart that would mean we still have a long ways to go up and still be normal. Tony had petrified palm trees he had found on his property that were growing 10s of thousands of years ago naturally. Clearly we have been much warmer in a natural cycle. I have heard this before but seeing it with my own eyes, on land 5 minutes from my house makes it a bit more real.